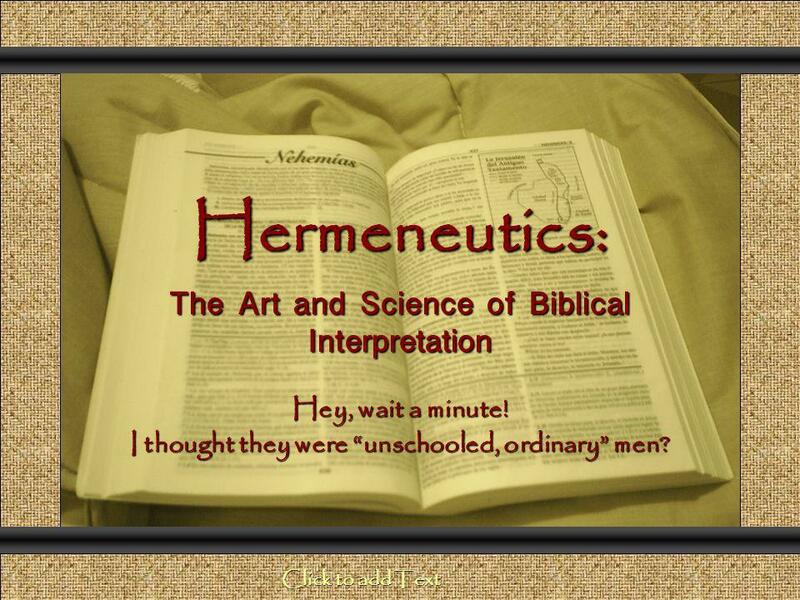 Hermeneutics: The Art and Science of Biblical Interpretation Comunicación y Gerencia Hey, wait a minute! I thought they were unschooled, ordinary men? 6 Principals for Interpretation 5. 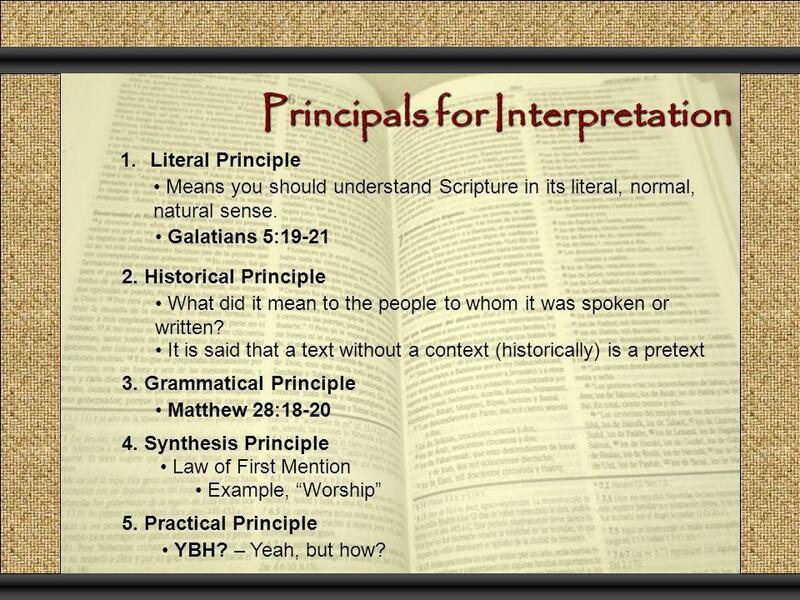 Practical Principle 1.Literal Principle Means you should understand Scripture in its literal, normal, natural sense. Galatians 5:19-21 2. Historical Principle What did it mean to the people to whom it was spoken or written? It is said that a text without a context (historically) is a pretext 3. Grammatical Principle Matthew 28:18-20 4. Synthesis Principle Law of First Mention Example, Worship YBH? – Yeah, but how? 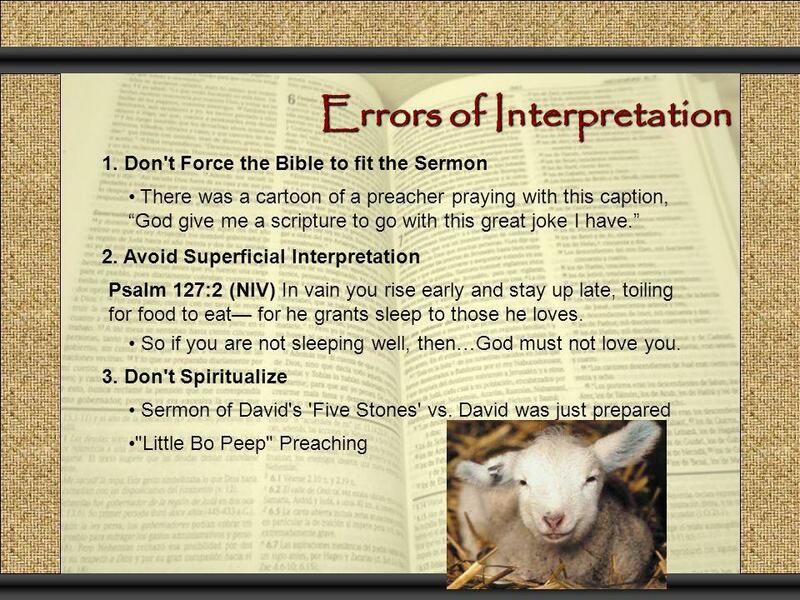 Download ppt "Hermeneutics: The Art and Science of Biblical Interpretation Comunicación y Gerencia Hey, wait a minute! I thought they were unschooled, ordinary men?" When Is A Doctrine Biblical?. God wants us to have teaching (doctrine) in our lives (sermons, personal beliefs, etc.) that is based upon nothing other. If Necessary Use Words Part 2. Beacon-Ministries Presents IS GOD’S WILL NECESSARILY THE CHURCH’S WILL? 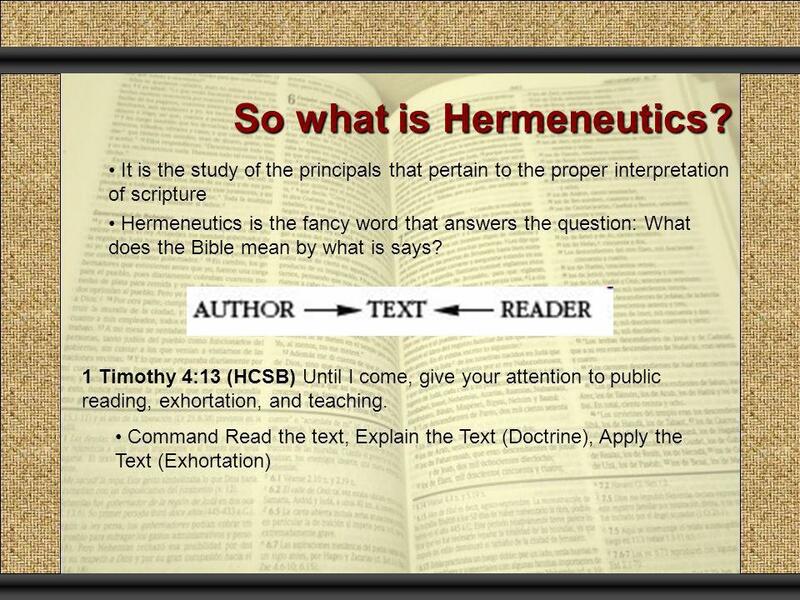 Hermeneutics The Study of Bible Interpretation. Bible Facts It’s a big book! 66 books – 39 OT, 27 NT Written over a period of 2,000 years Written on 3. Interpreting Scripture: The Ethical Teachings of Jesus. 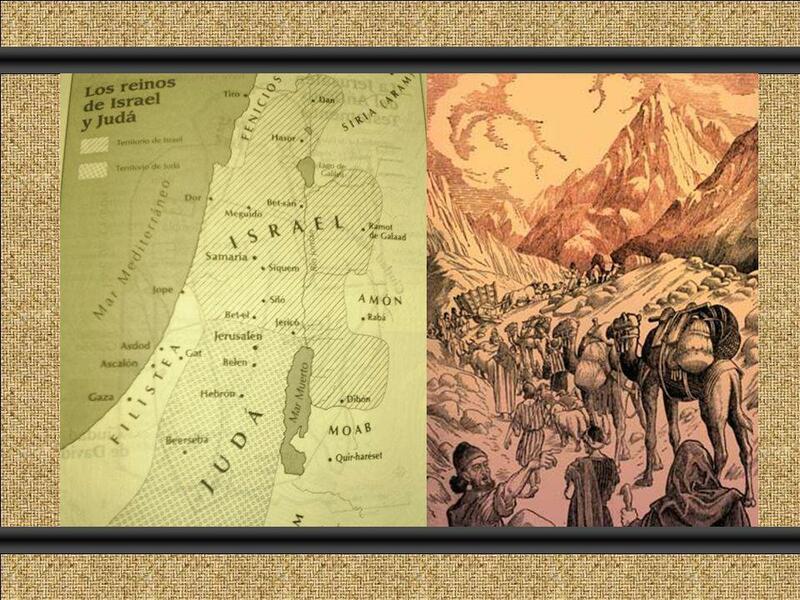 “GOD AND HIS WORD” PART I: THE INSPIRATION AND THE AUTHORITY OF THE BIBLE. Survey of Bible Doctrine Doctrine of the Bible Stephen E. LaFleur, ThD. Catholicism Today Scripture and Tradition Lesson 3. 8 And don’t for a minute let this Book of The Revelation be out of mind. Ponder and meditate on it day and night, making sure you practice everything. Too Busy For Christmas!. So what are we going to do about it? 1.Ask, what is my purpose? Too Busy For Christmas! 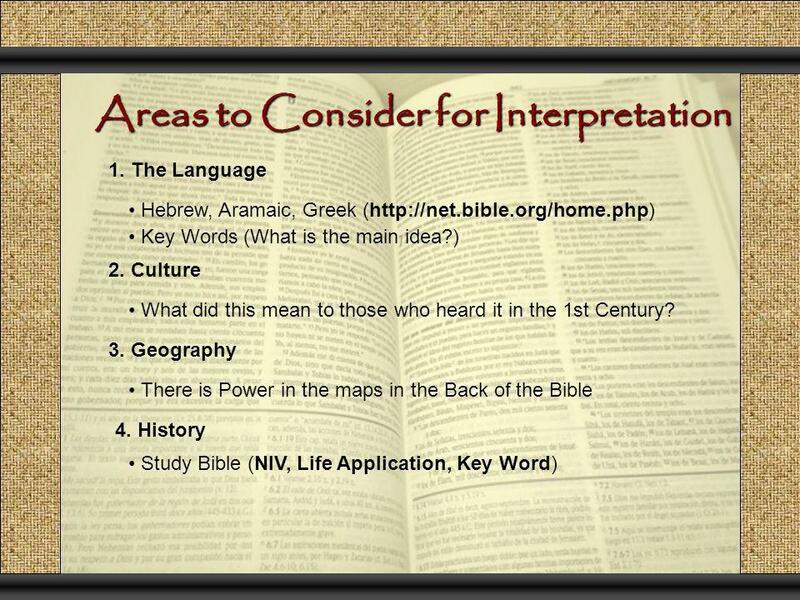 General Principles for Interpreting the Bible. APPROACH THE BIBLE IN PRAYER -Psalm 119:5 -Psalm 119:10 -Psalm 119:12 -Psalm 119: Psalm 119:34-37. Revelation and Inspiration What is the difference in these words? “Thinking Biblically in a Secular World” With eyes wide open to the mercies of God, I beg you, my brothers, as an act of intelligent worship, to give. C E N I The method of interpreting the Word of God. Giving Preaching The Word Part One. Review Knowing, Growing, Understanding, Living, Giving The giving of ourselves to assist others in reaching heaven.